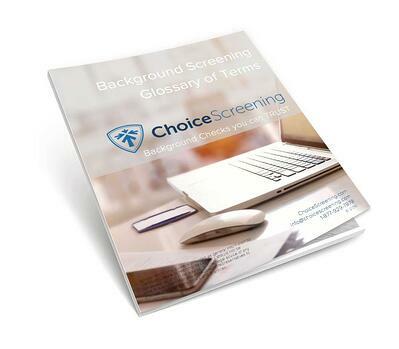 THIS is your all-in-one reference guide for everything background screening! From criminal records to verifications; from drug testing to Form I-9. The easier it is to understand your background report, the better your hiring decision will be! Choice Screening is committed to all our clients and anyone who values high-quality, comprehensive background screening for employment. The Background Screening Glossary of Terms will quickly become your go-to when requesting and using a background report - whether you're new to background checks or a seasoned veteran!